Goncharova's discovery of Spain, through a journey undertaken with her husband Mikhail Larionov in 1916 on the invitation of Sergei Diaghilev, would profoundly influence the artist's work, marking both her painting and her frequent ballet and theatre design projects. 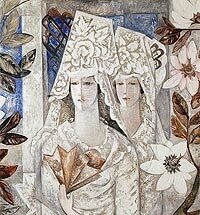 THE EXHIBITION "NATALIA GONCHAROVA. EAST AND WEST" AT THE TRETYAKOV GALLERY OFFERS AN OPPORTUNITY TO APPRECIATE NOT ONLY THE ARTIST'S FAMOUS PAINTINGS BUT ALSO HER LESSER-KNOWN GRAPHIC WORK. A VAST BODY OF THE LATTER WAS MADE USING THE POCHOIR TECHNIQUE, AND IS REPRESENTED COMPLETE WITH THE ORIGINAL SKETCHES. 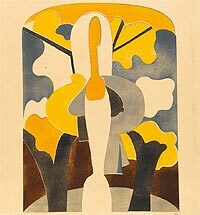 NATALIA GONCHAROVA IS ONE OF THOSE RARE PAINTERS WITH A PRONOUNCED TOUCH FOR THE MONUMENTAL FORM. IN HER RUSSIAN YEARS IT MANIFESTED ITSELF IN RELIGIOUS PAINTINGS THAT WERE FAR FROM "ORTHODOX" - AT LEAST BY COMPARISON WITH CONTEMPORARY ECCLESIASTICAL ART AS REPRESENTED BY TH E LI KES OF VIKTOR VASNETSOV AN D MIKHAIL NESTEROV - A FACTOR THAT EFFECTIVELY BLOCKED ANY POSSIBILITY OF HER RECEIVING OFFICIAL COMMISSIONS. IT WAS ONLY IN 1915 AFTER HER DEPARTURE FROM RUSSIA, THAT WITH THE HELP OF THE ARCHITECT ALEXEI SHCHUSEV THE ARTIST WAS COMMISSIONED TO DECORATE A PRIVATE CHURCH ON AN ESTATE IN BESSARABIA. EVEN THAT WORK WAS DOOMED NEVER TO BE COMPLETED, BECAUSE OF THE WAR AND REVOLUTION. The exhibition "The Basic Materials of Graphic Art: Paper and Wood, Silk and Glass..." features items from the Tretyakov Gallery's collection of drawings of the 18th-early 20th centuries. It is the final show in a series devoted to drawing materials, media and techniques used in Russia, and is intended to introduce to the public the history and diversity of the materials used in graphic art. The word traditionally applied to them in Russia — "the foundation" — most aptly characterises their role in the creation of an artwork, that of a "tuner" directing the artist towards a certain drawing style. The choice of material to a large extent determines how strokes or dabs of colour are applied — their tempo, rhythm, energy, and density. The exhibition is thematically arranged, exploring different kinds of materials and their characteristics such as structure, texture of the surface, colour, and tone. of an idea and the stages of its further development. But drawing also has a life of its own as an independent art form with a distinctive language, specific rules and history. Pencils come in many different varieties – silver, lead, graphite, black chalk, wax, coloured pencils, lithographic pencils and other types – and the word also refers to a large number of similar media which can be categorized as the techniques of “dry drawing”, like charcoal, sanguine and sauce. There is an almost limitless variety of techniques involving the use of these materials, and they serve to show off a particular artistÕs individuality, sense of form, innate talent and level of skills. A drawing in pencil, charcoal, sanguine or sauce is the best reflection of its creatorÕs temperament and character. From the vast variety of pencil and pencil-related techniques every epoch chooses those that suit it best. The age of classicism treasured the austere beauty of linear drawing, romanticism – the contrasts and the picturesque quality of strokes; for the “Peredvizhniki” (Wanderers) artists, pencils were “modest workers”, and the modernist movement re-invented the selfsufficiency of lines and the aesthetic value of the process of drawing as such. The exhibition “Mastery of the Pen”, featuring graphics from the holdings of the Tretyakov Gallery, is part of a show series focused on drawing techniques and media. The 300 pieces tracing the history of pen drawing in Russian art of the 18th-20th centuries include work by Karl Briullov, Alexander Ivanov, Fyodor Tolstoy, Ivan Shishkin, Isaac Levitan, Ilya Repin, Valentin Serov, Mikhail Vrubel, Konstantin Somov, Alexandre Benois, Wassily Kandinsky, Pavel Filonov, and many other famous artists. Over the last ten years the Tretyakov Gallery has been displaying drawings from its collections at temporary exhibitions. The exhibition programme has had a continuous focus on the history of the collection of 18th–20th century drawings. The gallery’s 20th exhibition in the series reflects a new stage in the history of its collection – namely, the significant enlargement of the collection in the first decade following the Bolshevik revolution due to new acquisitions from private Moscow collections.